There is increasing interest in the menaquinones, the forms of vitamin K2 that are produced in animal tissues and as a result of bacterial fermentation. What information there currently is in the scientific literature about its content in foods appears to be rather scattered in journals that few people have access to so I thought I would have an attempt to present some of the most relevant information together here. What I hope this will do is both show how limited the testing so far has been, the variation among similar foods, and the range of sub-types of vitamin K2 to be found in our foods. Vitamin K is an essential nutrient for the human body however rather than being a single compound it is composed of a group of structurally related compounds. These compounds all include the same active quinine ring molecule at their end giving them their vitamin K activity. Where they differ is in their side chains, with vitamin K1 having a tail of four phytyl groups, while the tails of the vitamin K2 sub-types are formed of a varying number of isoprenoid groups. Vitamin K1 (Phylloquinone) is always of plant origin and is the form of vitamin K that has been known longest. It’s occurrence in plant foods can be found detailed in food nutrient databases. Vitamin K2 (Menaquinones) is less well known and only occurs in foods of animal origin or foods altered by bacterial fermentation. Menaquinone-4 (mk-4), the sub-type produced by animal tissues and menaquinone-7 (mk-7), found in the fermented soya bean food natto, are the best studied but a number of other forms are found in fermented dairy products like cheese. Liver is often seen suggested as a source of vitamin K2 and beef liver in particular has been recommended as a good dietary source. From the tables below it seems that while the beef liver tested contains mk-4, it is not a particularly good source. However, most studies have not tested for long-chain menaquinones, mk-6 to mk-13, which are produced by the bacterial fermentation in the stomachs of cattle and provide them with a readily absorbable source of vitamin K2. When absorbed from the gut these reach the liver first where they appear to remain. This can be seen as very little long chain menaquinones were detected in any of the other meat or organs of cattle. The only small study that has tested for these found quite high levels of menaquinones 11, 12, and 13. I would like to see this confirmed but it does suggest that mk-4 is not the whole story in beef liver. Unfortunately, the total amount of vitamin K2 and the various menaquinones in beef liver is uncertain, as only lone small study has measured these. Poultry products, including liver, are generally a good source of vitamin K2 in the form of menaquinones-4. Other forms of vitamin K2 are not found in chicken as chickens have a limited capacity for bacterial production of menaquinones in their gut, relying instead on vitamin K in their diet. In their natural diet this would probably be provided by phylloquinone in the leaves of plants they eat which is converted into menaquinone-4 by the chicken. However, the feed of poultry is instead usually supplemented with plenty of menadione, a synthetic form of vitamin K (K3), that is readily converted in to menaquinone-4, resulting in high levels of mk-4 in all parts of the chicken. The menadione is added because chickens are vulnerable to vitamin K deficiencies, particularly when they are young, and the addition of menadione reduces the risk of this deficiency on commercial chicken farms. This leads me to suspect that the high levels of menaquinone-4 reported in the liver, meat and egg yolks of chickens tested so far, which are all most likely to have come from commercially reared chickens, may be due to their supplemented feed. It is possible that chickens kept under conditions that are more natural for the chicken will have lower levels of menaquinones-4 in their meat and eggs. My understanding is that due to the large amounts of bacteria in the guts of ruminants they do not usually require supplemental forms of vitamin K in their diets. Of all the animal foods foie gras, the fattened liver of force fed geese, stands out as the richest source of vitamin K2 in the form of menaquinone-4. It seems uncertain as to why this liver and their flesh contain such high amounts. Geese will graze on green plants to a greater degree than chickens, if given the chance, and perhaps they are just very good at converting phylloquinone to menaquinone-4. However, during the production of foie gras geese are fed a diet high in corn that is not a good source of vitamin K. I am uncertain as to whether their diets are also supplemented with menadione. The vitamin K in dairy products is mostly in the form of menaquinone-4 produced in the tissues of the cow from other forms of the vitamin in their diets for from their intestinal bacteria. Phylloquinone (K1) can also be seen in small amounts and must originate from the diet of the cows. As menaquinone-4 is fat soluble it is concentrated in dairy products with higher fat contents with butter containing the most. The various types of natto tested contain the highest content of vitamin K2 of any food in the form of menaquinone-7. Sauerkraut was also tested by a single study in the Netherlands and showed rather small amounts of a variety of menaquinones, although how traditional the methods of manufacture were is unknown. The menaquinones found in cheese are mostly mk-6 to mk-10 which are the menaquinones produced by the bacteria used in the production of cheeses. Small amounts of phylloquinone and menaquinones-4 are also found which originate from the milk used. The amount and mixture of menaquinones in fermented dairy products seems to vary quite a lot between different products and within the same type of product. Cheeses produced with propionibacteria, such as Jarlsberg, Emmental, and Gouda have been shown to contain some of the highest amounts in the form of menaquinone-9. However, the results here show that other types of cheese, including soft cheeses and blue cheese can equally contain high amounts of various menaquinones. The nutritional effect of this form of vitamin K on human health have so far received little attention. 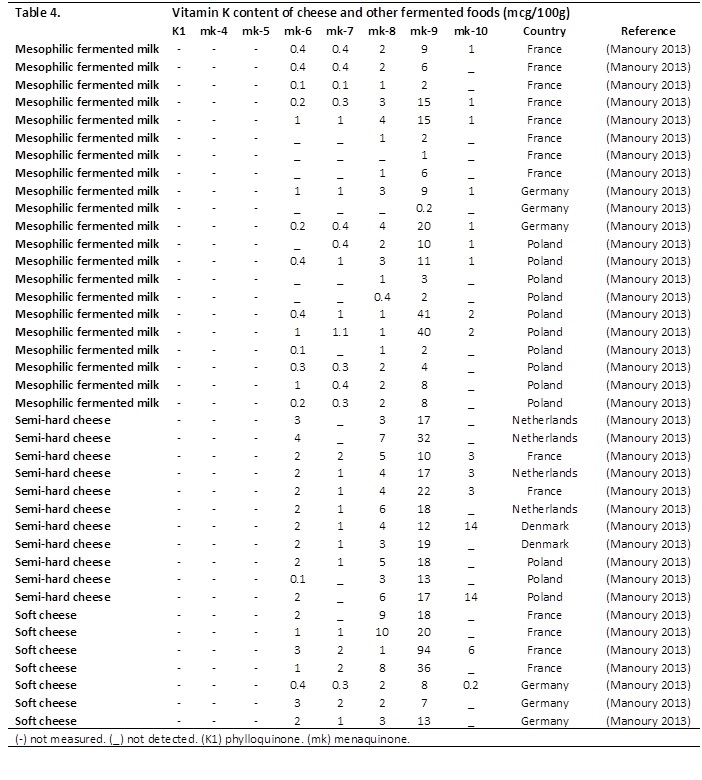 A surprising finding is the menaquinone-9 content of mesophillic fermented milks from various countries. Unhelpfully the study in question does not detail what these products were though mesophilic refers to the lower temperature of the fermentation and so implies that these were milk products such as kefir. Elder SJ, Haytowitz DB, Howe J, Peterson JW, Booth SL. 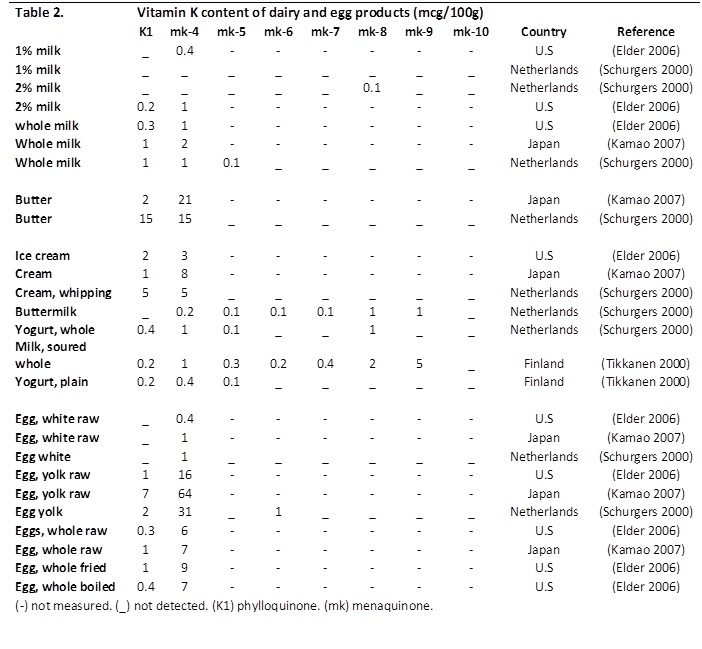 (2006) Vitamin k contents of meat, dairy, and fast food in the U.S. diet. Journal of Agriculture and Food Chemistry. 25;54(2):463-7. (Pubmed). Hirauchi K, Sakano T, Notsumoto S, Nagaoka T, Morimoto A, Fujimoto K, Masuda S, Suzuki Y. (1989) Measurement of K vitamins in animal tissues by high-performance liquid chromatography with fluorimetric detection. Journal of Chromatography. 29;497:131-7. (Pubmed). Hojo K, Watanabe R, Mori T, Taketomo N. (2007) Quantitative measurement of tetrahydromenaquinone-9 in cheese fermented by propionibacteria. Journal of Dairy Science. 90(9):4078-83. (Pubmed). Kamao M, Suhara Y, Tsugawa N, Uwano M, Yamaguchi N, Uenishi K, Ishida H, Sasaki S, Okano T. (2007) Vitamin K content of foods and dietary vitamin K intake in Japanese young women. Journal of Nutritional Science and Vitaminology. 53(6):464-70. (Pubmed). Koivu-Tikkanen TJ, Ollilainen V, Piironen VI. (2000) Determination of phylloquinone and menaquinones in animal products with fluorescence detection after postcolumn reduction with metallic zinc. Journal of Agriculture and Food Chemistry. 48(12):6325-31. (Pubmed). Manoury E, Jourdon K, Boyaval P, Fourcassié P. (2013) Quantitative measurement of vitamin K2 (menaquinones) in various fermented dairy products using a reliable high-performance liquid chromatography method. Journal of Dairy Science. 96(3):1335-46. (Pubmed). Schurgers LJ, Vermeer C. (2000) Determination of phylloquinone and menaquinones in food. Effect of food matrix on circulating vitamin K concentrations. Haemostasis. 30(6):298-307. (Pubmed). This entry was posted in Articles, Nutrition, Uncategorized. Bookmark the permalink. 117 Responses to The menaquinone (vitamin K2) content of animal products and fermented foods. Nice post. Are these your tables? They are mine and they are partly an experiment in the best way to add larger tables into wordpress. Do you have any data on the MK-4 content of pork brain and turkey testicles? Oh and beef bone marrow? Thank your for your comment. Unfortunately I do not think anyone has ever tested pork brain, turkey testicles, or bone marrow. You certainly sound like you have an interesting diet though! Thank you. Can you comment on the vitamin K2 content of beer, specifically IPA’s? Sadly beer is fermented using yeast which do not produce any vitamin K2, unlike bacteria. So you won’t find any in your IPA. But it also uses germinated and malted barley in the process. Wouldn’t that create K2? One thing I didn’t see was any distinction between grass-fed beef and grain-fed beef. Since K1 must be present for K2 to be produced during fermentation, the lack of K1 in grains should mean that grain-fed beef has minimal K2. I was curious if you tried Nattō in your research. I’ve heard that most find the taste of that fermented food rather challenging. Good points, I would love to see some testing done on animals that are known to be fed on grass based diets. While grazing must be a good source of dietary vitamin K1 cows also have a contant source of vitmain K2 from the bacteria in their rumen. However, how much of this is used by the cow and what role this plays in providing a base for the production of menaquinone-4 by the cow currently seems uncertain. I would love to try some natto. As I haven’t found any natto to buy here I even tried making some recently but I couldn’t keep the fermentation warm enough for long enough as it has been too cold over the winter. I could eat natto with a gun to my head, easy. It’s not that bad. It smells a bit vinegary. The main problem is the slimy sensation in the mouth, and a sense of needing to wash it down. I’m starting to wonder if loads of K1 via Kale/Collards and parsley might be better. I tried natto from My Organic Market in Maryland. It was fine. Sort of like brie cheese flavor. But it is stringy and a bit strange, so many may not like it. It’s probably like organ meats, brussels sprouts, etc., in that it’s easier to introduce it into the diet in infancy. First, the conversion of K1 to K2 in animal tissue is not accomplished by fermentation. Second, grains are quite high in vitamin K1, especially soy chow which is the animal feed of choice today in the western world. In Mathew’s excellent post of March 19, 2014 on the subject of dihydromenaquinone the vitamin K1 of soybean oil is given as 314 mcg/100 grams which is really stout. Soybean oil constitutes about 80% of vegetable oil consumed in the western world today whereas a century ago soybean oil was almost non-existent. Production of soybeans is driven by the demand for animal feed and the production of soybean oil for human consumption is a by-product of that demand. Animals are fed grain in order to increase feed efficiency, or weight gain per calorie of food. Grain increases feed efficiency because of the high linoleic acid (LA) content which impairs thyroid function and reduces energy expenditure. Both linoleic acid and vitamin K2 originate from plant tissue. It would seem that the vitamin K1 intake of grain fed animals would be higher than that of grass fed animals because of the higher content of vitamin K1 in the grain feed. Corn is also high in LA and I would therefor think it also has a high content of vitamin K1. 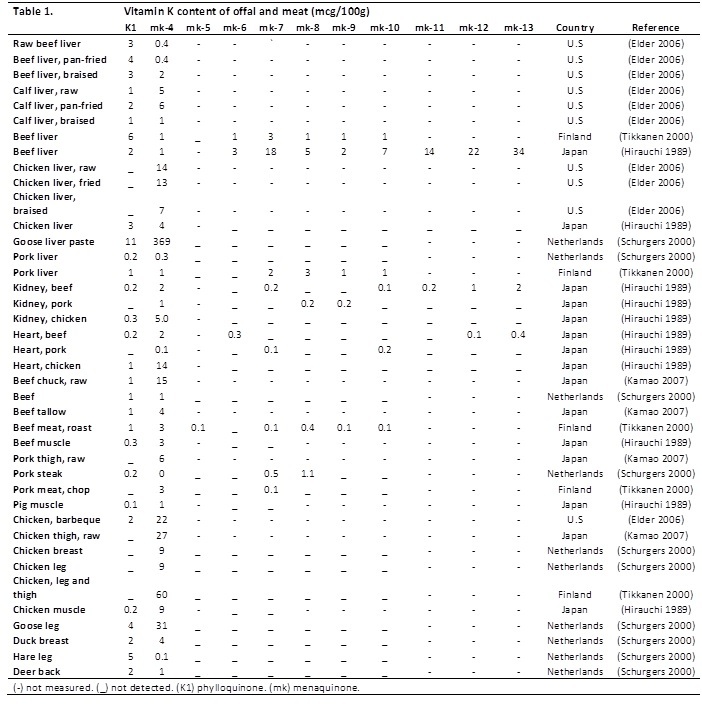 Why do you think there is a great difference in the K2 contents of Finland beef liver as opposed to Japanease Beef liver in Table 1? Is it because of the difference in what they are feeding the cows? Is there any vitamin K2 in honey? Very informative article. Thank you. Natto I eat daily for breakfast. Love it! One of the cautions of eating Natto is that its very concentrated in MK7, almost 1000 mcg of MK7 and if you are sensitive to it this causes sleeplessness and a fast or lumpy heart beat. Most of the commercial MK7 supplements are 100 mcg and under for this reason. I’ve read cases on the web of people being unable to sleep for days after eating 84 grams (3 oz) of natto. The MK4 form is most valuable produced by all mammals and doesn’t have any symptoms like this even when researched at 135 mg per day. Excellent summary of those scientific studies. It took many hours for me even to find those studies from the web and now you have compiled the contents! Your article is now mentioned in the Finnish Wikipedia: https://fi.wikipedia.org/wiki/K2-vitamiinit . Thanks a lot! Yes, Matthew, this is a great resource. Thanks so much. Anything anywhere about MiM — menaquinones in Miso? Miso is fermented using a fungus called Aspergillus oryzae and so is unlikely to contain any menaquinones as these are of bacterial origin. Your March 10, 2014, post on the Menaquinone (vitamin K2) content of animal products and fermented foods was of great interest to me. Of particular interest to me was the Manaury study that found that fermented milk (yogurt) contains a significant amount of vitamin K2 (MK5+) whereas the earlier Schurgers data showed K2 content of yogurt was insignificant. Further, the Manaury data on vitamin K2 content of cheese was lower than that given in the Schurgers study, which data was used in all observational studies. I have put together data from a number of recent studies that provide insight into the benefits of fermented dairy. I hope you find it of interest. A 2014 study by Curtin University, Perth, Western Australia found that beta-casomorphin-7, the A1 peptide that has been implicated in a wide range of of human health conditions as described by Keith Woodford in his book Devil in the Milk, is degraded during fermentation of yogurt. This study is strengthened by a 1996 study that found that beta-casomorphin is degraded during fermentation of cheddar cheese. Thus it appears that the problem peptide BCM-7 is eliminated in yogurt and aged cheese during fermentation. Data on the vitamin K content of fermented dairy foods has been very limited until relatively recently. The 2000 study Determination of phylloquinne and menaquinones in food: Haemostasis. 30(6):298-307 by by Schurgers, LJ and Vermeer, C. estimated the average vitamin K2 content of hard, soft and curd cheese to be 52.5 mcg/100 grams, 5% of which was subtype MK-4 and the rest MK-5, 6, 7, 8 and 9. The same study estimated the vitamin K2 content of yogurt and buttermilk to be about 2 mcg which is negligible. Data from the 2000 Schurgers study was used in a half dozen observational studies in the Netherlands and Germany between 2004 and 2010. The studies assessed the association between dietary vitamin K2 and CHD risk and mortality, coronary artery calcification, diabetes, and various cancers and found inverse associations between dietary vitamin K2, but not vitamin K1, and risk of CHD incidence, CHD mortality, coronary artery calcification, advanced prostate cancer and fatal lung cancer. The 2010 study on diabetes by University Ultrecht, Netherlands, found an inverse association between both vitamin K1 and K2 intake and risk of type 2 diabetes. The studies on heart disease and cancer attributed most of the observed protective effect of vitamin K2 to fermentation-derived vitamin K2, subtypes MK-5+, from fermented cheese. No mention was made of the vitamin K2 content of yogurt as it was apparently deemed to be negligible based on data from the 2000 Schurgers.study. A 2013 study, Quantitative measurement of Vitamin K2 (menaquinones) in various fermented dairy products using a reliable high-performance liquid chromatography method in the Journal of Dairy Science. 96(3):1335-46, by Manaury et al of France determined the fermentation-derived vitamin K2 content (MK5+) of 34 samples ot cheese and 21 samples of “mesophillic fermented milk” (yogurt). No estimated were given by Manaury for vitamin K1 or vitamin K2 subtype MK4 content. The total average vitamin K2 content of yogurt based on the Manaury study is about 14 mcg/100 grams (1 mcg MK-4+13 mcg MK5+) which is 7 times greater than the 2 mcg/100 grams given in the 2000 Schurgers study. Similarly, the average estimated total vitamin K2 content of fermented cheese based on the Manaury study is about 34 mcg/100 grams (6 mcg MK-4 +28 mcg MK5+) which is about 40% less than the 52 mcg/100 grams given in the 2000 Schurgers study. The estimates of vitamin K2 content of fermented dairy products given in the 2013 Manaury study were determined by the latest testing methods so it is reasonable to assume that they are more accurate than the estimates given in the 2000 Schurgers study. It is concluded that fermented milk products such as yogurt are a significant sources of vitamin K2. It is noted that the vitamin K2 content of yogurt per calorie is about double that of aged cheese. 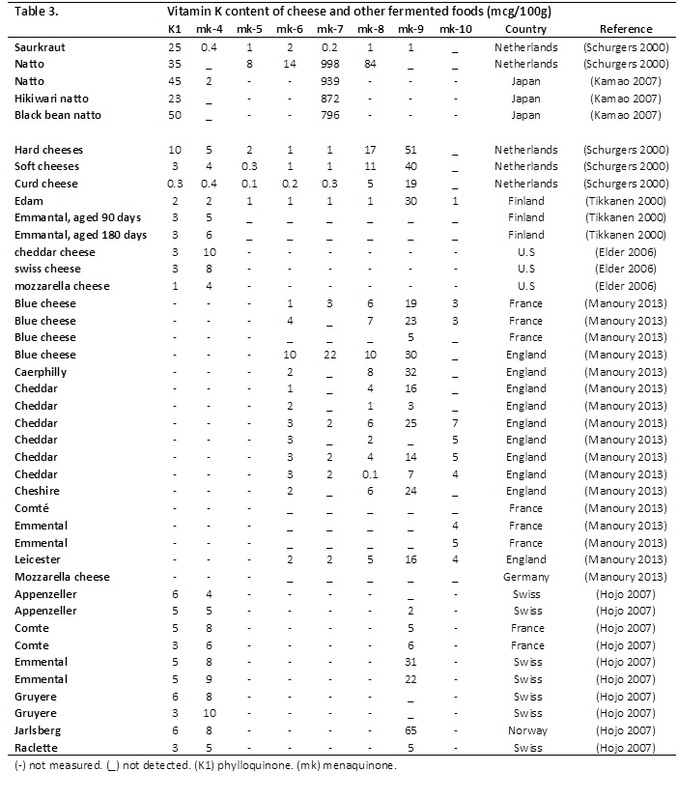 All observational studies that assessed the association between various diseases and dietary vitamin K, as estimated by,food frequency questionnaires, utilized the data on vitamin K content of foods given the in 2000 Schurgers study which estimated the fermentation-derived vitamin K2 (MK5+) of yogurt to be negligible and the vitamin K2 content of cheese to be high, on the order of 52 mcg/100 grams. These observational studies were undertaken in the Netherlands and Germany which both have high per capita consumption of yogurt and fermented cheese. Two observational studies in the Netherlands found an inverse relation between dietary vitamin K2 and coronary heart disease incidence and mortality. Both studies concluded that menaquinones from dairy were more protective than those from meat, and that vitamin K2 subtypes MK-7, MK-8 and MK-9 from fermented cheese consituted about 75% of total vitamin K2 intake. .A 2009 study at Utrecht University, Netherlands, found that dietary vitamin K2 is associated with reduced coronary calcification. Intake of vitamin K1 was not associated with any outcome in the studies. A 2010 study at University Utrecht found that type 2 diabetes was inversely associated with both dietary vitamin K1 and vitamin K2. A 2008 study in Germany, Dietary intake of vitamin K and risk of prostate cancer, found an inverse association between intake of vitamin K2, but not vitamin K1, and advanced prostate cancer. Vitamin k2 from dairy had a stronger inverse association with advanced prostate cancer than did vitamin K2 from meat. Intake of cheese high in fermentation-derived menaquinones and intake of MK-4 vitamin K2 from unfermented foods were both found to be independently associated with reduced advanced prostate cancer. A subsequent study in 2009 also found an inverse association between dietary vitamin K2, mainly from cheese, and fatal lung cancer. Overall, the observational studies suggested that vitamin K2 intake was protective against heart disease, coronary artery calcification, advanced prostate cancer, fatal lung cancer and type 2 diabetes, and that the protective effect was mediated primarily by the fermentation derived vitamin K2 subtypes from cheese. The estimates of vitamin K2 content of fermented cheese and fermented milk given in the Manaury study, together with estimates of per capita cheese and yogurt intake in the Netherlands and Germany suggests that about 35% of vitamin K2 intake from fermented dairy products in the two countries was derived from yogurt and 65% from cheese. It is noted that in both the German and Netherlands studies, the estimated intake of vitamin K2 derived from fermented dairy of approximately 16 mcg/day is about the same whether using data from the 2000 Schugers study or data from the 2013 Manaury study because the higher vitamin K2 content of yogurt offsets the lower vitamin k2 content of cheese. Using the 2013 data base for vitamin K2 content of foods instead of the 2000 Schurgers data base thus does not alter the results of the studies. As noted previously, a 2010 study at University Utrecht found that type 2 diabetes was inversely associated with both dietary vitamin K1 and vitamin K2. Subsequent studies, discussed hereinafter, have found that risk of type 2 diabetes is inversely associated with yogurt intake which strengthens the Manaury findings that yogurt contains significant vitamin K2 content. The the University Medical Center Ultrecht, Netherlands, conducted a study in 2012 which investigated the association of intake of total dairy products and five different dairy subtypes within 8 European countries with incidence of type 2 diabetes. Baseline dairy product intake was assessed by using dietary questionnaires. No association between total dairy product or milk intake and diabetes risk was found during 12 years of followup. Of dairy subtypes, cheese tended to have an inverse association with diabetes, and a higher combined intake of fermented dairy products (cheese, yogurt, and thick fermented milk) was inversely associated with diabetes in analysis that compared extreme quintiles with a pooled adjusted hazard ratio (HR) of 0.88. Potential protective constituents of dairy that were discussed by the authors included saturated fatty acids, pro-biotic bacteria and vitamin K2 which is largely synthesized by pro-biotic bacteria. The authors noted that the inverse association found when yogurt and thick fermented milk were combined with cheese supports the idea that fermentation-related mechanisms may be involved in the protective association. It was also noted that the Ultrecht Center had conducted a study in 2010 that found the dietary vitamin K2, most of which came from fermented dairy,was inversely associated with risk of type 2 diabetes. There was a marked variation of intake of dairy subtypes in the populations of the 8 countries (France Italy, Spain, UK, Netherlands, Germany, Sweden and Denmark.). Data on intakes of dairy subtypes was shown graphically for each of the eight countries and hazard ratios of diabetes risk were given for each country for intake of each of the five dairy subtypes. understanding of the study results is enhanced by comparing four countries that that consume the most fermented dairy products with the four countries that consume the least fermented dairy.. The pooled hazard ratio of diabetes risk in the countries that consumed the most fermented dairy products (France, Netherlands, Germany and Sweden) was 0.87 for yogurt, 0.78 for cheese and 0.75 for combined cheese and yogurt intake. It thus appears that cheese was the main driver of reduced diabetes risk. Based on the Manaury estimates of vitamin K2 content of cheese and fermented milk the fermentation derived vitamin K2 of the four countries averaged 20 mcg/day, of which 60% came from cheese and 40% from yogurt. Thus it appears that the protective effect of fermented dairy is roughly proportional to vitamin K2 content which suggests that vitamin k2 intake may be associated with reduced diabetes risk as found in the 2010 study. The their 2010 study on the inverse association between dietary vitamin K2 and type 2 diabetes the same authors concluded that vitamin k2 may be associated with reduced risk of type 2 diabetes. The failure of the authors of the subject study to conclude that the protective effect of yogurt is may be due to vitamin K2 may be because the data base of vitamin K2 content of foods that was available at the time showed the vitamin K2 content of yogurt to be insignificant. In my opinion the inverse association observed between fermented yogurt and cheese intake and risk of type 2 diabetes is clearly mediated by vitamin K2,. A 2014 study by the Cambridge School of Clinical Medicine, UK, was similar in many respects to the aforementioned 2012 University Utrecht study regarding the association of intake of total dairy and dairy subtypes with incidence of type 2 diabetes but the study was limited to UK residents and dairy intake was divided into nine dairy subtypes rather than five. The authors of the Cambridge study were also co-authors of the 2012 Utrecht Study. The Cambridge study, like the Ultrech study, found no association between total dairy and milk intake and diabetes risk. The Cambridge study found that intake of “yogurt” and “low fat dairy” ( which is 87% yogurt) were both inversely associated with risk of type 2 diabetes. In contrast, the Ultecht study of UK subjects found no association between yogurt intake and diabetes risk most likely because yogurt intake of UK in that study was less than half the intake of subjects in the Cambridge study. The study conclusion that “greater low-fat fermented dairy product intake, largely driven by yoghurt intake, was associated with a decreased risk of type 2 diabetes development” was widely erroneously reported as follows: “subjects with the highest low-fat yogurt consumption had a 28% lower risk of developing type 2 diabetes”. The Cambridge study states :”we report null associations for total fermented dairy intake and cheese intakes —” The statement is, inconsistent with data from table 3 which, for “total fermented dairy” shows an HR of 0.81 for model 1, 0.84 for model 2 and 0.85 for model 3. The authors go on to suggest that “previous findings from FFQ data (meaning the 2012 Ultrecht study) may have been driven by low-fat fermented dairy intakes. This suggestion is inconsistent with results of the Ultrecht study which found that in the four countries with meaningful intake of cheese and yogurt, the pooled RR of 0.78 for cheese intake is far stronger than the RR of 0.87 for yogurt intake.. The authors’ attempts to attribute the observed inverse association between fermented dairy intake and diabetes risk mainly to “low-fat fermented dairy” does not stand up to simple scrutiny. While some of the study conclusions and suggestions are unconvincing because of the inconsistencies in classification of dairy subtypes, the conclusion that diabetes risk is inversely associated with intake of yogurt was adequately supported. The data suggests that the reduction in risk associated with yogurt intake is mediated by vitamin K2 content and, further, that the Manaury data on fermentation derived vitamin K2 content of yogurt is more accurate than earlier data which showed insignificant vitamin k2 content in yogurt. One aspect of the Cambridge study worthy of note is the assessment of the reduction in diabetes risk resulting from substitution of a serving of yogurt for a serving of snacks or deserts. Of eight types of foods evaluated, the greatest apparent protection resulted from substituting yogurt for “snacks” (defined as “crisps”, or potato chips in the US) which resulted in a 47% decrease in diabetes risk. The finding is consistent with obeservational and laboratory studies which have found that excessive intake of linoleic acid (LA), which constitutes about 25% of the calories in potato chips, is associated with increased risk of thyroid impairment, insulin resistance, obesity and type 2 diabetes. It has been estimated that during the past century dietary LA has increased from 2% to 7% of calorie intake. Dietary guidelines that recommend substituting vegetable oils for animal fats are thus contributing to increased incidence of diabetes and obesity. In Denmark, allergic asthma has increased almost two-fold over the past 15 years. In 2012 the Harvard School of Public Health, together with the Statens Serum Institute, Denmark, undertook a study in Denmark to examine the association of dairy product intake during pregnancy with child asthma and allergic rhinitis at ages 18 months and 7 years. Data on milk and yoghurt consumption were collected in mid-pregnancy (25th week of gestation) using a validated FFQ (n 61 909). For yoghurt, children of women who ate more than one serving a day of low-fat yoghurt had 1.21 greater odds of a medication-related ever asthma diagnosis compared with children of women reporting no intake. They were also more likely to have a registry-based ever diagnosis and report allergic rhinitis. Low-fat yoghurt intake was directly related to increased risk of both child asthma and allergic rhinitis. At the 7-year assessment maternal low-fat yoghurt consumption was directly associated with child asthma and allergic rhinitis. In later childhood, it was found that low-fat, but not full-fat, yoghurt was directly related to the outcomes assessed. Furthermore, odds of child asthma increased across intake categories, with intake of low-fat yogurt exceeding 1 serving/d being of most concern. The authors concluded that nutrient components or additives specific to low-fat yoghurt may be mediating the increase in risk, but the diversity and complexity of results make it difficult to interpret and propose a single agent mechanism. Efforts to compare low-fat yogurt intake in the US with low fat yogurt intake in Europe have not been successful. The following report from Reuters suggests that most yogurt consumed in Europe is traditionally made whole fat yogurt, while most yogurt consumed in the US in non-fat and low-fat yogurt. Thank you for such an in depth and informative comment. I very much enjoyed the quote at the end too. I would love to tell people that they don’t need to be concerned about the BCM in A1 milk if they ferment the milk into cheese or yogurt or possibly kefir, but “intriguing unknown” sounds pretty tentative. Are you aware of any further support for fermentation as a means to degrade BCM? “The validated isotope dilution LC-MS/MS method was used to measure BCM5 and BCM7 in ten commercial and laboratory prepared samples of yoghurt and milk. Neither BCM5 nor BCM7 was detected in commercial yoghurts. However, they were observed in milk and laboratory prepared yoghurts and interestingly their levels decreased during processing. BCM5 decreased from 1.3ng/g in milk to 1.1ng/g in yoghurt made from that milk at 0day storage and <MLQ at 1 and 7days storage. BCM7 decreased from 1.9ng/g in milk to <MLQ in yoghurts immediately after processing. These preliminary results indicate that fermentation and storage reduced BCM5 and BCM7 concentration in yoghurt." The fact that no BCM5 or BCM7 was found in commercial yogurt, and that BMC7 decreased from 1.9 ng/g to MLQ (0.25 ng/g) immediately after processing indicates that BMC7 degrades rapidly during fermentation and continues to degrade during storage. Perhaps I exaggerated a bit in saying that BMC7 is destroyed during fermentation, but the fact that no BMC5 or BMC7 was found in commercial yogurt indicates that BMC7 is largely degraded during fermentation and subsequent storage. Similarly, lactose is degraded by about 25% during yogurt fermentation and further reduced during storage. In the book "Devil in the Milk", the author Woodford attributes the oxidant characteristics of BMC7 for oxidation of LDL that leads to atherosclerosis and heart problems. Many studies have found that vitamin K2 has anti-oxidant properties. The vitamin K2 content of yogurt per calorie is higher than most foods in the western diet and the subtypes MK-7 and MK-8 found in fermented are more lipid soluble (and hence more available) than subtype MK-4 found in non-fermented foods such as meat, milk, butter and eggs. It my opinion that the fermentation of yogurt not only reduces the yogurt content of BMC7 but also counteracts the oxidant properties of any remaining BMC7 in the yogurt. Woodford states that BMC7 is a problem mainly in those with a leaky gut, which includes infants who all have a leaky guts during the first few months of life. Overall, I don't think that BMC7 is a problem in well made yogurt. Cornucopia, http://www.cornucopia.org has recently published a report on available yogurt in the US which describes the vast majority of available yogurt as "junk food". The report includes a "scorecard" which scores how closely production of available yogurts comply to "organic" standards. Almost all yogurt produced in the US is low fat or non-fat yogurt to which milk solids containing oxidized cholesterol has been added together with a variety of thickeners and sweeteners in an attempt to improve taste and texture. Fermentation of non-fat yogurt will produce vitamin K2 but the bio-availability of the K2 is probably poor as it is a fat soluble vitamin. The only yogurt available locally that gets a decent score on the Cornucopia scorecard is Stoneyfield whole milk organic yogurt which is sold at one supermarket nearby . I buy that yogurt for consumption and for use as a starter in making yogurt. The sentence I quoted was a truncated version of the last sentence in the abstract found at PMID 25077377. Perhaps the editors of Crit Rev Food Sci Nutr. (25077377) required a more tentative conclusion regarding degradation of BCM than the editors of Food Chem. (24177353). I hope that the amount of degradation of BCM in kefir made using kefir grains would be comparable to that found in yogurt. I believe my raw milk is sourced from A2 cows, but one can’t be sure about A2 status without testing. Nice to know the A1/A2 issue may be moot if consuming fermented dairy products. Hi, I was checking the research you posted (E. Manoury, 2013) to discover scientific evidence about the amount of vitamin K2 in yogurt. In your comments above, you said that yougurt is a Mesophilic fermented milk. However, yougurt is a Thermophilic fermented milk (http://www.culturesforhealth.com/difference-between-yogurt-kefir). And, according to the same research (E. Manoury, 2013), unfortunately, thermophilic fermented milk has not significant amounts of vitamin K2..
Have I understood this research incorrectly? I consume yougurt almost daily and I am curious to know if it is a good source of this vitamin. Hi, It is my conclusion that fermented yogurt is an excellent sources of vitamin K2. You must have misunderstood the Manaury study as it did not say that thermophilic milk was an insignicant source of K2. Perhaps you misunderstood my comment that the earlier study (2000) by Schurgers that showed the K2 content of yogurt to be insignificant. The Manaury study showed that the average K2 from fermentation (MK-6-MK10) in fermented milk was 12 mcg/100 grams which is equates to about 20 mcg/100 calories. While the average vitamin K2/100 grams from fermentation (26 mcg/100 gr) was shown to be about twice as high as that of yogurt, the average K2 content from fermentation per 100 calories of yogurt is about three times that of cheese. While cheese and yogurt are both good sources of K2, I think yogurt is the better source. All lactose fermenting bacteria utilize vitamin K2 as an electron carrier in their respiratory system so they must synthesize vitamin K2 to survive. The “long chain” vitamin K2 subtype MK-9 synthesized by fermented dairy is more lipid soluble and more readily absorbed than “short chain” MK-4 from animal fats. The vitamin K dependent protein osteocalcin is readily activated by dietary doses of “long chain” vitamin K2 from lactose fermentation, but not by dietary dose of MK-4. All vitamin K subtypes can be converted to MK-4 “in vivo”. It has been found that the “long chain” MK-9 from dairy fermentation is a better suppliers of MK-4 than MK-4 itself. (PMID 23140417) Thus fermented dairy provided a superior form of vitamin K2 compared to the MK-4 from animal fats. So yogurt is indeed an excellent source of vitamin K2. Hi Jack, thanks for your quick response. First, I should say that I do not have a background in the area to understand the process in which vitamin K2 is chemically created. But i am avid and curious reader about the subject. My conclusion are thus conclusion that I take from a few sources that I deem trustworthy. Back to the topic, I am afraid the difference about the Thermophilic and mesophilic fermentation makes a difference in the K2 production. In your last reply you made the comparison between cheese and yogurt. But I think you are using fermented milk and yougurt interchangeably, while in the research the authors do not do it, as I have just shown in the quote. Incidentally, discovering about the influence of fermentation process in the production of vitamin K2, I have searched for options other than cheese. First, I found kefir but I was not very excited about it. Fortunately, afterwards, I discovered that there are some varieties of yogurt that are produced through mesophilic fermentation that sound delicious. I’ve just ordered a starter for Caspian see yogurt, also known as matsoni. It supposedly tastes good. If you change your mind and get disappointed about vitamin k2 in yogurt, you can give it a try. If not, I would be pleased if you can find some research that indicates significant amounts of vitamin k2 in yogurt. (I have an yogurt maker, so I’ve got keep using it too). Hi Helio, I stand corrected! After reading the full text of the Manaury 2013 study I have to agree that the evidence indicates that yogurt contains little or no vitamin K2. So it appears that the 2000 study by Schurgers that showed that the K2 content of yogurt was insignificant was correct. I am glad you sent the link to the full text to the 2013 Manaury study as I had tried many times without success to get the full text of the study. For the past eight years, since reading the Chris Masterjohn article of 2007 on vitamin K2 , I have been eating a lot of raw milk cheese as a source of vitamin K2. I first bought raw milk cheese from a local “artisan” cheese-maker which was fairly expensive and required a 70 mile round trip to get it as they did not ship. (I live in Alabama) I now buy a half dozen varieties of cheese made by an Amish Pennsylvania farmer from milk of pastured Jersey cows that are fed only grass and silage. I buy fifteen pounds at a time as it keeps very well in the refrigerator. The cheese is aged at least 60 days as required by federal law. I am confident that the cheese is made with mesophilic cultures. I also buy raw milk butter, which has some K2, from another Amish farmer. In the past I have bought other dairy products from the Amish farmers including kefir and mesophilic fermented milk (which they called yogurt) but I now limit my purchases to cheese and butter which are more easily shipped. I have always spurned yogurt based on the prevailing belief that yogurt is not a good source of vitamin k2. Data given in the 2013 Manaury study that shows that the K2 content of “mesophilic fermented milk” per 100 grams is about twice that of cheese attracted by interest. And you are right that I incorrectly used mesophillic milk and yogurt interchangeably. Fortunately you corrected my misunderstanding not long after I created it. The matsoni fermented dairy sounds good. While the optimum temperature of the two cultures used in most mesophilic fermented milk, lactococus lactis, subspecies lactis and cremoris, is 77 to 88 degrees F, they will function up to 102 degrees F. so maybe you could use your yogurt maker for the matsoni if you can control the temperature. Thank you for this informative piece! I also love the end comment. I have to say that one reason nutritional tables (or measurements) of foods differs so much has to do with variability in the feedstuffs. In dairy, in particular, the nutritional profile varieries considerable with season and also with geography. For several reasons. animals are fed differently in different seasons and the the temperate zone they also live differently. This mostly pertains to grass-fed and organic animals. Industrialized animals productions have more or less the same living conditions and feeding throughout the years. But both industrialized animal productions and organically farmed animals are fed differently in different places, ie. geography. Therefore the differencies in the studies you refers, can very well be explained by a natural variability in the nutritional profile of food and perhaps not by the difference in methods used. We can only compare methods if we know the uncertainties of their results. And if we know the uncertainties, results from older methods are not of a lower quality than results from newer more technological advanced methods. This is a basic rule of science. I am glad that you appreciated my efforts. I was delighted to find your excellent post on the vitamin K content of foods not long after you posted it and since that time have been pondering the significance, with respect to past observational studies, of the updated estimates of fermentation derived menaquinone contents of fermented foods (cheese and yogurt) given by Manaury in his 2013 study. For the past seven years, since Chris Masterjohn published his article about vitamin K2, aged cheese from raw milk of pastured cows have been a staple of my diet and my main source of vitamin K2. I get additional vitamin K2 from milk, cream and butter made from milk of grass fed cows. I figure that the dairy provides significant vitamin A and some vitamin D in addition to vitamin k2. While I don’t know if the dairy from grass fed cows contains more vitamin K2 than dairy from grain fed cows, I do know that it contains more omega-3 fats and less omega-6 fats than milk from grain fed cows and, further, it is all organic with no GMOs. I live in Alabama where raw milk is not legal but a local dairy produces organic milk and cream that is pasteurized but not homogenized and comes from cows that are grass fed all year. The cream is the only cream available around here that in not ultra-pasteurized and dosed with thickeners like carrageenan. My wife does not care for my cheese but loves whole fat yogurt so I was glad to learn that yogurt contains a significant amount of vitamin K2 and also degrades the problem A1 beta-casomorphin. (the “milk devil”) present in most milk. Phil Earnhardt, in his march 11 comment, stated —“K1 must be present for K2 to be produced during fermentation”. That sounds reasonable. If that is true, then it seems that fat free yogurt would contain little or no fat soluble vitamin K and hence would not produce vitamin K2 when fermented. It would be interesting to see that theory confirmed by tests. Great discussion here. Really appreciate the detailed rsponse from Mr. Cameron. I too am concerned about the substitution of low-fat for whole milk dairy products. I am particularly troubled by the National School Lunch Program guidelines that ban whole milk dairy products. I have started a petition to reverse the ban: http://tinyurl.com/l566trk . Please sign if you are so inclined. Paul, The ban on whole milk products in the National School Lunch Program is absurd and the recommendation to substitute polyunsaturated vegetable oils for animal fats greatly compounds the resulting adverse health effects. Early in the year my cardiologist asked my opinion of the recent Cambridge study which concluded that “Current evidence does not clearly support cardiovascular guidelines that encourage high consumption of polyunsaturated fatty acids and low consumption of total saturated fats.” Here is a brief summary of what the study is about. The conclusions are the same as those found in a similar meta-analysis undertaken about five years ago. The major difference between the two studies is that the latter analysis included more studies. The Cambridge study was a meta-analysis of 72 different studies from 18 countries involving about 600,000 people. includes information not in the abstract which concludes that (1) increased dietary diary fat is associated with lower cardiovasular risk (2) higher levels of omega-3 EPA and DHA in the blood stream were protective against heart disease, but vegetable oils, that are high in omega-6 fats “pose risks” and (3) supplements which contain omega-3 EPA and DHA from fish did not reduce cardiovascular risks. You might find the study abstract and the New York Times article of interest. I started a detailed reply to my doctor but got sidetracked by other things and never finished. I just discovered this wonderful website and I have signed your petition. The philosophy of the Weston A. Price Foundation is totally in line with your effort to overturn the ban on whole milk dairy products in the NSLP. I wonder if you have tried to enlist their support. They have a website, local chapters in the U.S. and internationally, and publish a quarterly magazine called Wise Traditions. At a minimum, you could write a letter to the editor of their magazine and ask the readership to sign the petition. Thank you for signing the petition. Yes, WAPF does good work promoting whole-fat foods. I’ve left comments with the link on one of their pages but I need to coordinate with them more closely. Thanks again. As a member of WAPF, I seldom look at their website unless I’m looking to confirm something I had previously read. But I do devour the Wise Traditions publications, and I suspect you would get much greater response to your petition if you had a letter show up in the Letters section. The Letters section is always at the very front of the magazine and is the first thing I read. The Letters section of the Fall 2014 issue ran for 13 pages. There is much content in the magazine that doesn’t show up on the website. The email for Wise Traditions is info@westonaprice.org. The Annals saturated fat study has gotten a lot of press. Just read it thoroughly. Most interesting is that the fatty acid with the strongest inverse association with coronary disease is Margaric acid, found primarily in dairy products. That finding deserves an exclamation point, but it was largely overlooked in media reports. Score another one for butter. Thank you for signig the petition. Gram positive bacteria, including lactose fermenting bacteria and pathogenic bacteria such as tuberculosis, produce vitamin K2 which acts as an electron transfer agent in their respiratory chain. The vitamin K2 is essential to their survival. A recent study found that the tuberculosis bacteria can be killed by inhibiting an enzyme required for synthesis of vitamin K2. Propionibacterum freudenreichii (ET-3), a lactose fermenting bacteria found in raw milk and sometimes used in cheesemaking, produces both vitamin K2 and DHNA (1,4-dihydroxy-2-naphthoic acid) during anaerobic fermentation. DHNA is a precursor of vitamin K2 that is transformed to vitamin K2 by combination with an isoprenoid unit. DHNA can be a stimulator of bifidogenic growth and the purpose of the two studies was to enhance production of DHNA for use as a probiotic. It was found that ET-3 (propionibacterum freudenreichii) stopped producing vitamin K2 and increased DHNA production in an anaerobic fed-batch culture by when the lactose concentration was “reduced to approximately zero”. It is apparent that a carbohydrate source such a lactose is needed for vitamin K2 synthesis. Lactose in the experiments was provided by skim milk powder which indicates that fat is not needed to produce vitamin K2.by fermentation. It is also apparent that the presence of vitamin K1 is not required for production of vitamin K2. In the expermiments, production of vitamin K2 stopped after five days of fermentation when lactose was depleted. The studies found that propionibacterum freudenreichii produces vitamin K2, subtype MK-9 whereas lactococcus lactis commonly used as a “starter” in cheesemaking produces MK-8, MK-9 and MK-10. In cheese production, whey containing much of the carbohydrates of milk is drawn off from the curd and wasted, so the carbohydrate (lactate) initially available for vitamin K2 synthesis in cheese,as a percentage of calories, is less than that available in fermented milk. The lactose in cheese is most likely depleted within the first five days of fermentation. Yogurt is usually fermented for 8 to 24 hours before being refrigerated so fermented milk, such as yogurt, contains much more vitamn K2 per calorie than cheese. While it appears that vitamin K2 can be synthesized by fermentation of non-fat milk, vitamin K2 is a fat soluble vitamin and its bioavailabilty from whole-fat milk is therefor greater than that of non-fat milk even if both contain the same about of vitamin K2. Thus it appears that all gram positive lactose fermenting bacteria must produce some amount of menaquinones and utilize lactose as a carbohydrate source. The amount and type of menaquinones produced varies with different types and strains of bacteria. It seems that production of vitamin K2 stops after lactose is depleted. It also seems to me likely that when cheese is aged for a very long time there will be a gradual degradation of the menaquinones in the cheese. Thank you very much for this post it is very informative for me since I am breastfeeding so I need k2 a lot. D you have any number about kefir fermented milk I mean homemade from kefir grains not from store one. Thanks a lot. Wow what a great and helpful compilation. Thank you! Andrea, You are right, butter does not have a lot of vitamin K2. Grass fed cows get vitamin K2 from green grass but grain fed cows are often fed vitamins including menedione that increases K2 content of the milk. So whether butter from grass fed cows have more K2 than butter from grain fed cows is really not known. I eat raw grass fed “spring” butter for a number of reasons but not for the K2. I like to support the farmers that make the butter for one thing. I specifically avoid “Land o’ Lakes butter because they have been donating to the big industry that has been fighting, an defeating, efforts to require labeling of GMO products. My wife does not carefor my “strong” butter so we buy some butter that is not grass fed. Vitamin K is a fat soluble vitamin that plays a major role in the clotting cascade. There are two naturally-occurring vitamin K compounds: vitamin K1 (phylloquinone) derived from green plants and vitamin K2, (menaquinones, MK-n), which is a series of vitamers with different side chain lengths(The “n” in MK-n). MK-4 is found in animal products such as eggs, meat, and liver. Long chain vitamin k2 (i.e. MK-7, MK-8, and MK-9) are found in fermented foods such as cheese, curd, and yogurt. So fermented yogurt and cheese are excellent sources of vitamin K2. I greatly appreciate your thoughtful responses. As a pharmacist, the mechanistic detail is fascinating. At some point I would love to have a bibliography of your reading on k2. Just pubmed IDs would be great. Thanks again. Yes Jack thank you so much for the thoughtful response. I am so glad for the help! I have a paper list of some older K2 abstract numbersfiles and some files scattered on my computer that include brief abstracts with PUBMED numbers. The older paper files would probably not be of much interest to you. The information below, which came from my e file on vitamin K2 and fermented dairy, covers a lot of the factors under discussion. If you want to send me your address I will send you data on other abstracts. My e-mail address is Jandpc@bellsouth.net. A high intake of vitamin K2 from fermentation reduces cancer (mainly prostate and lung) mortality. Thank you for the bibliography. I’ll be in touch via email soon. Would Soy Milk Koumiss or Kefir have much K2 in it since both processes use a combination of Probiotic Bacteria and Yeast, the main differences is with Kefir it’s a SCOBY while the Probiotic Bacteria and Yeast are Separate in the Koumiss Fermentation? What’s your input on that? This is a lot to take in when I’ve just started researching K2. I’ll take my time but in the meantime I am taking a K2 supplement to ward off the family bugbear – osteoporosis. My question is similar to the last one. Is there any K2 in kombucha tea? I have just started using this and wonder if it could also have this benefit. It is also a SCOBY but lives on sugar and tea. Spectacular article! Real data— just great! I’ve read some of the articles you based your tables on, but you went above and beyond compiling the data. Bravo! You mention in the text of your article that gouda is high in K2. However, I don’t see the data for gouda in your chart. I also could not find actual data for gouda anywhere on the internet. I was wondering if you had the data for gouda? Mathew’s statement about high amounts of menaquinone-9 found in some cheeses, including Gouda, related to cheeses made with propionibacteria which is used to put the holes in Swiss and other cheeses. Gouda cheese is sometimes, but not usually, made with starters that include some propionibacteria so there is no reason to expect that menaquinone content of Gouda will be higher than other cheeses.. It is probable that the longer cheese is aged, the lower the the vitamin K2 content. In fermentation of milk by mesophllic bacteria, the vitamin K2 is synthesized from lactose. When lactose is largely depleted, probably within a week, production of vitamin K2 stops and thereafter vitamin K2 content declines slowly. While the vitamin K2 content of foods is traditionally expressed per unit of weight, it makes more sense from a nutritional standpoint to express the vitamin K2 content in terms of K2 per calorie. The data from the Manaury study shows that the average vitamin K2 content of the cheeses tested was 7 mcg/100 calories compared to an average K2 content of mesophilic fermented milk of 20 mcg/100 calories. Mesophilic fermented milk, such as raw milk clabber or kefir, is therefor a better source of vitamin K2 than cheese. Yes, I know about propionibacteria. I’m just trying to track down actual, measured DATA for Gouda. In the chart Matthew presented, he assembled data on K2 measurements from various scientific papers. It appears from that data that Jarlsberg has the highest K2 per gram. There is no actual data on Gouda. Interesting information on mesophilic fermented milk. However, at least according to the data Matthew assembled, it seems the range of K2 available is very broad. As Manoury said: “We observed wide diversity of vitamin K(2) contents in the set of fermented dairy products, from undetectable to 1,100 ng/g of product.” How does one choose a reliable food source if the range of K2 content is so large? The broader questions I am trying to address here is the following: What commercially available source (outside of Natto) has the the highest K2 concentration? I would like to learn more about the biochemistry of K2 production. You mention that K2 is produced from lactose by mesophilic bacteria. I could not find any information on this biochemical process after a thorough search. If you could send me in the right direction to learn the biochemistry of this, I would be grateful! Finally, there seems to be a lot of research on MK7 and MK4 in MEDLINE, but very little on what is actually the most common source in cheese: MK9. (MK7 is present in cheese in small amounts, but most highly concentrated in Natto.) Do you know of any research comparing the different effects of MK9 versus MK7? As far as I know there is no data for the Vitamin K2 content of Gouda cheese. This is despite Gouda being widely claimed online as being one of the best sources of Vitamin K2. I think this originates to a misreading of Kate Rheaume-Bleue’s book “Vitamin K2 and the Calcium Paradox”. In this book she lists “Hard cheeses (Gouda Style cheese)” as having 76.3 mg of K2 per serving, a high amount. I suspect people have misread this as Gouda having that much K2, although in fact it does not seem to have been tested, or at least not reported anywhere I could find. As Jack mentioned though, due to the use of propionibacteria in its production Gouda probably does contain a reasonable amount of K2, although it is often best not to assume too much with such things! There is sadly no research on the health effects of the Vitamin K2 subtypes found in cheese such as the MK9. Much of the study of Vitamin K2 is based on research from Japan, where cheeses have not traditionally formed a big part of the diet. I have no expertise on the synthesis of Vitamin K2 by bacteria. But bacteria can often produce everything they need from whatever basic food sources they are growing on. This old paper is the most comprehensive I know of on K2 synthesis by bacteria: http://www.ncbi.nlm.nih.gov/pmc/articles/PMC281544/ This says that bacteria use Shikimate as the basis for K2 production. Shikimate is produced from scratch by bacteria as it is also a step in the process of making some amino acids. Once again, great post. Thank you. Pingback: Your Teeth and Your Diet: What’s the Deal? Lori, Excessive vitamin D can greatly increase calcification and cause a lot of problems. When vitamin D went from obscurity to the head of the vitamin Hit Parade sometime during the last ten years people began to push for higher and higher intakes of vitamin D which can cause problems. For most people, intake of 400 IU/day is adequate. The article below concerns the fact the either to little or too much vitamin D causes aortic calcification. The high doses often prescribed by doctors are really bad. Regarding vitamin K, the primary source of vitamin K is phylloquinone, vitamin K1, from green vegetables. Yeah, I know the prevailing wisdom is that vitamin K2 is more biologically active than vitamin K1, but that is true only for the long chain K2 from fermentation, not for MK-4 from animal fats in butter and eggs. MK-4 from animal fats is poorly absorbed and is only about 20% as effective as vitamin K1 in activation of osteocalcin. The preponderance of evidence indicates that MK-4 contributes little to the activation of VKD proteins. Keep in mind that the average intake of vitamin k1 is about 150 mcg compared to average intake of MK-4 on the order of 10 mcg. Since MK-4 is only 20% as effective as vitamin k1 in activating VKD proteins, its contribution to carboxylation is negligible. In contrast, MK-7 from natto and MK-9 from dairy fermentation are more than twice as effective as vitamin K1 in carboxylating osteocalcin. Fermented cheese has a pretty fair content of MK-9 but the MK-9 content of fermented milk is about twice as high as cheese because the vitamin K2 is derived from the lactose.. Fermented (clabbered) milk was once commonly consumed but has about disappeared since the advent of pasteurization and refrigeration. For vitamin K2, Mk-9 I buy raw milk and clabber it and also eat a lot of raw milk fermented cheese. There is a great deal of variability in the availability of vitamin K1 different vegetables. Spinach has a lot of vitamin K1 but it is tightly held and poorly absorbed. The vitamin K1 in broccoli is easily absorbed. We eat a lot of broccoli and other green vegetables. Thanks for the info, specifically on the fermented milk! I an Danish and we used to drink quite a lot of buttermilk. I have started incorporating it in my diet again, because it is quite refreshing and I like the taste (and price). Would like to know how much K2 is in it though. Thanks for this very valuable information. I was trying to find ways to improve my dental health and got to look for sources of K2. I was indeed suggested to eat natoo. I read that mk7 is especially recommended against osteoporosis. But otherwise, I didn’t find more precisions about the differences between K2 vitamins for that specific issue. Hi. I don’t know you dental problems of course, but I myself have had extraordinary results from simply supplementing with magnesium-calcium tablets. Even the cheap dolomit with carbonates has provided great result for me personally. D3 can also be a good idea to consider. Vitamin C and CoQ10 can do wonders for your gum health. I forgot to aks: can some foods inhibit the absorption of K2 vitamin, like tannic food (coffee, tea etc)? Thank you for posting the information on the content of the different types of Vitamin K2 in Saurkraut. DOES RAW MILK (goats,cow,sheep etc) KEFIR CONTAIN ADEQUATE AMOUNTS OF K2? What is the vitamin k2 content in raw goat milk kefir ?has there been any study done on that? and how much would you have to take daily to acquire the recommended dosage? One of the most useful pages I have found yet on the internet! It is easy to find dietary recommendations on how to increase the K2 intake, but none of them explains how much is in each foodstuff. As I can see, there is a very large deviation between each study, highly dependent on the location apparently. Japan persistently comes out with higher values. Another noteworthy observance is that is seems very difficult if not impossible to reach the minimum intake of 45 mcg/day. This lower limit has been established for therapeutic reasons and anything less will not have any measurable health promoting effects. Most recommendations sets a daily recommended intake between 45 and 200 mcg/day. Animals create most of their own K2 as you also explains in the article. You have specialized in gut flora, so perhaps you know what the human capacity is for producing K” in the gut? It might depend on a number of factors of course, but perhaps the human gut can produce more than enough, even without dietary intake? Perhaps it would even have a better effect than adjusting diet, to simply optimize the gut flora? Thanks for your input. Great with the source-links. I will read up on the details for sure, as I find the topic interesting. From what you write though, I can’t completely see the argument holding water. In Dalby’s article above he also touch the connection, that dietary intake of Vitamin K (ie K1 if you will) affects the bacterial production of vitamin K2. This would mean that the bacteria can’t produce K2 from every nutrient they get, but will need to be fed proper amounts of K1. K1 however is abundant in almost every food item we eat and it will not be a problem to get adequate amounts through any diet. In this light, bacterial production of K2 in the human gut is still an open question. At least for me. But, I will see how it is tackled in your article-links. Vitamin K1 is the substrate for the endogenous production of vitamin K2, sub-type MK-4, by mammals. MK-4 is called short chain menaquinone as it has the shortest side=chain lengths (4) of all menaquinones. In 2010 it was determined that the MK-4 synthesizing enzyme is UBIAD1. UBIAD1 also synthesizes CoQ10. Cholesterol lowering statins inhibit UBIAD1. Here are two articles related to UBIAD1. Vitamin K1 is not involved in synthesis of “long chain menaquinones, mainly MK8 and MK-9 by lactose fermenting bacteria such as lactococcus lactis. The endogenously produced Mk-4 is not produced by bacteria. It appears that lactose is the substrate for vitamin K2 production by lactose fermenting bacteria. Fat is not required as indicated by experiment that used fat free milk to produce vitamin K2. Endogenously produced MK-4 is found in high amounts in the brain, kidney and pancreas but not the heart which suggest important functions of MK-4 in those organs. It is probable the the high levels of UBIAD1 mrna expression, in the heart, which has low MK-4 levels, indicates CoQ10 protection of the Heart. The vitamin K2 found in the large colon are “long chain” meanquniones produced by bacteria, not endogenously produced MK-4.derived from K1. There is a lot of erroneous information around even in published scientific papers which I will address later. Tvarog or twarog is a kind of cottage cheese made from cultured soured milk. If you look at the DM percentages in the table it would seem likely that a lot of the MFMs have similar percentages of dry matter. So if you think about it you start out with milk cultured with lactococcus and leuconostoc bacteria similar to that used in viili, but you keep fermenting it. It forms curds, you press the curds and get rid of the whey. And then it continues to ferment at a slower rate in the fridge. It is kind of amazing that twarog does so much better than many of the cheeses, but no surprise that it and a lot of the other MFMs in the table do better than viili or soured milk. Tvarog or Twarog is a kind of cottage cheese. It is made from milk soured with leucononstoc and lactococcos bacteria, that ferments until it forms curds, and indeed continues to ferment as those curds are pressed. The dry weight percentages tell some of the story. Milk has a dry weight of about 14%. These MFM do better than viili (for example) even though it uses the same bacteria. I imagine that this is in part because they have been able to ferment longer, in part because the whey has been discarded doubling the concentration of the MK (they are 25 and 29% dry matter) and, of course, since a lot of the other MFMs seem to also be cheeses, it must also have something to do with the particular strains of leuconostoc. They also noted that the MK concentrations in Caerphilly and Cheshire were associated with their lactococcus content. Maybe if we combined them we would have a super strain of tvarog. excellent write up,very informative. but please can u help with method of extraction and quantification of phylloquinone using spectrophotometer. HI, is it true that natto is the only vegan source of vitamin K2? since kelp is apparently a good source would abalone or urchin ( uni ) also since their primary diet is kelp? This information about the k2 content of animal and fermented foods was really very well done. I really appreciated it a lot and I also really enjoyed reading and studying all of the replies especially those by Jack Cameron. I don’t have a strong science background so I have spent a lot of time reading and digesting all of this excellent information. I am on a quest to find as much information as I can about cholesterol and heart disease, which led me to some articles about k2 suggesting that it lowers cholesterol and fights calcification of the arteries. On this internet journey and quest I came upon some of Chris Masterjohn’s work where he also writes about K2, Cholesterol and heart disease. He mentions sources of vitamin K2 but does not include kefir. When I emailed and asked him why he didn’t include kefir, he said that there are no studies measuring the K2 content in Kefir therefore he doesn’t include it as a source for that vitamin. I take it that many of the people, who replied to this article do believe kefir contains K2 and some seem to suggest that it is an excellent source. I’d like to hear a bit more about the K2 content in Kefir if possible. I make it and drink it all the time. It seems there may not be any actual measurements of kefir specifically for K2 but it seems that since it is a particular kind of fermented milk product, there are many who believe it must have k2. So, now I want to move a bit away from this topic and ask for assistance if possible from any of the contributors to this lengthy work and discussion. I hope this is okay. To be as succinct as possible: I have a very clear family history of heart disease. Recently I discovered I have a genetic trait that causes me to have lots of lipoprotein a. Recent research seems to suggest it is a signal for very high chances of heart disease so my doctor is pushing me to go on Lipitor. cholesterols levels of close to 300 or over 300 are all normal now but they are all experiencing unpleasant side effects. I have been able to keep my total cholesterol at 210 or so. I eat a diet very close to the one that Weston Price suggests so perhaps that is why my cholesterol is much lower than my siblings levels (when they are not on Lipitor.) They eat the SAD-Standard American diet.
. Interestingly enough, I just read a recent meta analysis about lipoprotein a in the Journal of Clinical Lipidology, which reports that statins and a low fat diet raise lipoprotein a rather than lowering it so I am prepared to share that information with my doctor during our next visit. Well, I hope I have not gotten too far off track here. I would appreciate any help or information anyone out there has to offer. I don’t know if this is proper etiquette but I’d like to offer my email so that folks can email me directly and not further distract from this great discussion about K2. I will wait to give that email until Matthew gives me an okay on that. In the meantime I thank all of you for this great sharing of information. The confusion between vitamin K2, MK-4 and MK-7 due to inaccurate nomenclature in published studies has resulted in the widespread erroneous belief that all forms of vitamin K2, including MK-4 which is synthesized from vitamin K1, are more biologically effective than phylloquinone (vitamin K1) in activation of vitamin K dependent proteins (VKD proteins). Consequently, vitamin K2 is often erroneously referred to as “THE cofactor for matrix GLA protein activation”, and the terms MK-4 and vitamin K2 are often erroneously used interchangeably in scientific publications. MK-4, which is synthesized from phylloquinone, is only 25 to 40% as biologically effective as phylloquinone in GLA protein activation. Further, the quantity of Mk-4 consumed from animal fats is only about 10% of the quantity of phylloquinone consumed. While MK-7 from natto and MK-9 from fermented dairy are more effective than phylloquione in GLA protein activation, they are not widely consumed and do not significantly contribute to human vitamin K requirements. These facts lead to the unavoidable conclusion that phylloquinone (vitamin K1), not vitamin K2, is the PRIMARY cofactor for matrix Gla protein activation. Recent studies have determined that some past assumptions regarding vitamin K function were not correct and consequently conclusions based on those assumptions are also wrong. It has been found that the uncarboxylated form of osteocalcin, not carboxylated osteocalcin, is the active form the hormone osteocalcin that is involved in glucose homeostasis, energy expenditure, male fertility, brain development and cognition. According to these studies, carboxylation of osteocalcin “inhibits its endocrine function”. Because vitamin K1 can not be absorbed in sufficient quantities to completely activate osteocalcin, it was incorrectly concluded that vitamin K2 is an essential nutrient needed to fullyy activate VKD proteins . It appears however, that the inability of humans to absorb enough vitamin K1 to fully activate GLA protein protects the body against impairment of endocrine function and that the amount of K1 that is absorbed is adequate. Vitamin K2 is therefore not an essential nutrient. The earlier assumption that VKD proteins must be carboxylated to be biologically active is not correct and the resulting conclusion that vitamin K2 is almost universal is also not correct. The enzyme that converts vitamin K1 to MK-4 to has been identified as UBIAD1. A recent study has found that MK-4 and UBIAD1 suppress cholesterol synthesis in the blood vessels. MK-4 is also important to cognitive function. My e-mail is jandpc@bellsouth.net. Send me your e-mail and I will send more information. So is there benefit to eating carboxylated osteocalcin? Is natto to be dethroned as the preeminent source for Vitamin K? Has the degree of Vitamin K benefit that could be obtained from raw milk homemade kefir been clarified any? Is it wrong to ask about Vitamin K and do I need to instead ask about the specific forms of phylloquinone or menaquinone? Looks a bit like the confusing description of Vitamin E as a singular chemical structure. There are many tocopherols. Eight if I remember correctly. And synthetic tocopherols have a different chemical structure than “natural tocopherols”, which makes many scientific tests using “Vitamin E” dubious. At this point I wonder whether the most recent literature is in error underlining the errors of the previous literature (which would make the previous literature still valid) or the most recent literature is right, if so I can throw away Kate Rheaume-bleue’s monography, together with the newly acquired bottle of costly MK-7 supplements, in the junk bin. Jack, I’m an health buff so I eat no processed food and my dose of phylloquinone is luckily often well above 100% RDA because of the plentiful servings of vegetables & fruit I eat. But I’m still nonplussed by the vitamin K2 issue and I’m going to ask you by e-mail the literature material you would so kindly provide. I concur, also, it’s MK4, available from other meat sources like chicken liver where the animals do not undergo such massive and deliberate torture. I’ve studied many articles and studies related to K1, MK4 K2 and MK7 K2 in an effort to evaluate what amount of these vitamin K forms would be available in the diet prior to synthetic production of vitamin K2. You have managed to condense the most important data related to my question within about 2 pages. This is a product of a very organized mind that can cut through the irrelevant data. You’re article is the best (by far) effort to clarify this. I very much appreciate your efforts. Wow, great article and posts, I am so fortunate to have found this! I began exploring K2 in attempt to raise my Vit D levels as advised by my doctor. I read that Vit D cannot be absorbed without the presence of K2, and noticed K2 was not part of my Vit D supplements. I am middle aged, and it’s funny, but all the women I know that are my age, and older, are diagnosed with low Vit D, and advised to supplement. These women keep increasing Vit D dosages in an effort to achieve better results in their blood tests, and most of these vitamins do not contain the K2, so I thought maybe this is the reason they are not getting better results. Thus, my continued research on K2. It seems difficult to know the best source of K2, how to get adequate amounts in the diet, and to test if one is, or is not, benefiting from attempts to raise K2 levels. After reading all the back and forth here, could it be that K2 is not part of most Vit D supplements because it’s simply not conclusive to be necessary? If it weren’t for the Vit D issue, I would never have discovered the topic of Vit K2, and subsequent rabbit hole of conflicting research and opinion. To the best of your knowledge, is it true that Vit D cannot be used in the body without K2? Matthew, Jack, or anyone who has looked into this, I would so much appreciate your insight. A lot of the conventional wisdom surrounding vitamin K2 is based on erroneous assumptions which led to the erroneous conclusion that vitamin K2 is an essential nutrient. This problem is discussed in my post of November16, 2016 above. One erroneous assumption that was widely accepted in the past was that non-hepatic vitamin K dependent proteins such as osteocalcin must be activated to be of any value. However, it has been found that un-activated osteocalcin is the active form of the hormone and that excessive activation of osteocalcin causes problems. It is my conclusion that “vitamin K2” is not an essential nutrient as widely believed. In contrast, vitamin K1 (phylloquinone or PK), which comes from green vegetables, is essential. Vitamin K1 is endogenously converted to vitamin K2, sub-type MK-4, in the body. MK-4 is found in high concentrations in the brain and a few other organs. The best way to get vitamin K1 is to eat greens because the body will not absorb more K1 from food than you need whereas vitamin K1 supplements are easily absorbed and theoretically you could get more K1 from supplements than is healthy. It is my opinion that vitamin K2 may be beneficial in some ways but it is not essential. You need to get enough of both vitamin D and vitamin K1 .So in my opinion vitamin K2 is not needed for vitamin D absorption. Whether K1 is needed form vitamin D absorption I don’t know but if you get enough vitamin K1 anyway so what does it matter. I eat greens daily for vitamin K1. I also like cheese and fermented milk which contain a lot of vitamin K2 but I honestly do not know what the benefits of vitamin K2 are. Vitamin K–dependent proteins, including matrix Gla-protein, have been shown to inhibit vascular calcification. Activation of these proteins via carboxylation depends on the availability of vitamin K. We examined whether dietary intake of phylloquinone (vitamin K-1) and menaquinone (vitamin K-2) were related to aortic calcification and coronary heart disease (CHD) in the population-based Rotterdam Study. The analysis included 4807 subjects with dietary data and no history of myocardial infarction at baseline (1990–1993) who were followed until January 1, 2000. The risk of incident CHD, all-cause mortality, and aortic atherosclerosis was studied in tertiles of energy-adjusted vitamin K intake after adjustment for age, gender, BMI, smoking, diabetes, education, and dietary factors. The relative risk (RR) of CHD mortality was reduced in the mid and upper tertiles of dietary menaquinone compared to the lower tertile [RR = 0.73 (95% CI: 0.45, 1.17) and 0.43 (0.24, 0.77), respectively]. Intake of menaquinone was also inversely related to all-cause mortality [RR = 0.91 (0.75, 1.09) and 0.74 (0.59, 0.92), respectively] and severe aortic calcification [odds ratio of 0.71 (0.50, 1.00) and 0.48 (0.32, 0.71), respectively]. Phylloquinone intake was not related to any of the outcomes. These findings suggest that an adequate intake of menaquinone could be important for CHD prevention. The table in my comment yesterday did not come out right and I made an error in the amount of cheese consumed in the lowest quartile of K2 intake.kBoth problems are corrected below. Those consuming the most K2 consumed 300% more vitamin K2, 60 % more calories, 440% more cheese. 210 % more dairy products and 75% more meat. The conclusion by the authors that vitamin K2 was the cause of reduced cardiovascular disease ignores other possibilities. For example, the higher intake of vitamin A associated with milk and cheese intake could well be responsible for improved health. I will ad more information later. While your comment was dated April 15, I did not receive it until April 29 (today). For some reason your comment does not provide an opportunity for a reply so I must reply to my own comment. I understand your frustration concerning my conclusion that vitamin K2 is of unproven value and that vitamin K1 is the most important K vitamin for health. From the above data you can conclude that those who consumed the most K2 were those that were the most highly educated and therefor had greater income. Those consuming the most K2 consumed 300% more vitamin K2, 60 % more calories, 250% more cheese and 75% more meat. .It is my conclusion that the reduced risk of prostate cancer of those consuming the most K2 was not due to K2 per se but due to a much better overall diet. Similarly, the reduced risk of heart disease among those with high K2 intake in the Rotterdam study was most likely due to overall diet. I can provide other reasons for my conclusions but time does not permit at the moment. The following is in further response to the April 15, 2017 post by Jim west regarding the Rotterdam Study which was conducted in the Netherlands in 2004 that followed 4807 men and women for 8 years and concluded the dietary menaquinone (vitamin K2) is associated with reduced risk of coronary heart disease. A 2016 study conducted in the Netherlands which assessed the effect of menaquinone intake on 33,289 participant, aged 20 to 70years, that were followed for 16.8 years.came to the opposite conclusion! Authors of the study included several who were also listed as authors of the 2004 Rotterdam study and other subsequent studies on the same subject. Dietary intake was assessed at baseline with a validated food frequency questionnaire and intakes of phylloquinone, and total, short chain and long chain menaquinones were calculated. Information on vital status and causes of death was obtained through linkage to several registries. It was concluded that vitamin K intake was not associated with all-cause mortality, cancer mortality and mortality from other causes. Do you think the age of a cheese can impact the amount of vitamin k2? Thank you for this wonderful detailed post btw. During fermentation of cheese and milk Vitamin K2, sub-type MK-9, is apparently synthesized from lactose as MK-9 synthesis stops when lactose is depleted, usually after about five days of fermentation. Raw milk cheese must be fermented for at least 60 days to be legally shipped across state lines. Vitamin K2 production in cheese therefore quits after about five days. I suspect that the K2 content slowly declines after lactose is depleted. I have been buying many varieties of excellent raw milk cheese ($6.50 a pound) from a Pennsylvania farmer for about ten years now. I also make “clabber” (mesophilic fermented milk) from local raw milk (for pet consumption) and usually age it for 24 to 36 hours based on taste so it may not have maximum K2. Thank you for your answer. I have another question. Do you think it matters for vitamin k2 whether a cheese is made with rennet or vegetable enzymes? The raw cheese I’m currently purchasing is made with vegetable enzymes. The purpose of rennet in cheese-making is to coagulate the milk and it is my understanding that vegetable enzymes can accomplish the same thing so I don’t think it matters. Another question I have regarding k2 is whether k2 is heat resistant? For example, would a boiled egg still contain k2? Thanks! I’ve wondered this as well. Most of these sources are cooked, including ghee. Does heat harm K2? Anna, It is my understanding that heat does not effect vitamin K 2 so boiling an egg will not reduce K2 content, which is sub-type MK-4 of vitamin K2. The most common error regarding vitamin K is to refer to “vitamin K2” as though it were a single chemical entity with the implication that menaquinones possess identical metabolic profiles and activities. This trend originated in Japan from where numerous scientific articles on the cell biology and health effects refer to vitamin K2 in the title and text for studies carried out with a specific MK, usually with MK-4 but increasingly with MK-7. The confusion was exacerbated by the commercial synthesis within Japan of MK-4 that was widely promoted as vitamin K2 which led to confusion as to which chemical structure was being described. (1) The confusion between vitamin K2, MK-4 and MK-7 due to inaccurate nomenclature in published studies has resulted in the widespread erroneous belief that all forms of vitamin K2 are similar in function and are all more biologically active than phylloquinone (PK or K1) in activation of vitamin K dependent proteins. The widespread notion that MK-4 is more effective than PK in activation of VKD proteins is not only incorrect, it is safe to say that the effect of dietary MK-4 on VKD protein activation is not significant. A study 2009 by the University of Wisconsin: “Vitamin K treatment reduces uncarboxylated osteocalcin but does not alter bone turnover, density or geometry in healthy postmenopausal north American women”, clearly shows that vitamin K1 (PK) is about fifty times more effective than MK-4 in activating VKD proteins. In this double-blind, placebo-controlled study, 381 postmenopausal women received phylloquinone (1 mg daily), MK4 (45 mg daily), or placebo for 12 months. All participants received daily calcium and vitamin D(3) supplementation. Baseline uncarboxylated osteocaline was about 12% of total osteocalcin, so carboxylated osteocain was 88%. Intake of both 1 mg of PK and 45 mg of MK-4 reduced uncarboxylated osteocalcin equally to about 4.5% of total osteocalcin. It is apparent that PK is about 45 times more effective in activation of osteocalcin than MK-4. The average dietary intake of MK4 is about 10% of that of PK which indicates that the contribution of MK-4 to VKD protein activation is on the order of 0.2% which is not significant! It is concluded that the only menaquinones widely consumed in the western world that contributes to activation of VKD proteins are those contained in fermented dairy products, mainly cheese, which are mostly MK-9. The results of the study are consistent with other studies that show that MK-4 is far less effective than PK in activation of VKD proteins. In Japan, a dose of 45 mg of MK-4 (or 45,000 mcg) has been used for treatment of osteoporosis for about two decades. The 45 mg dose, which equates to 45,000 mcg, is about 4500 times greater than average daily MK-4 intake of 10 mcg. Meat, eggs and whole fat dairy products are touted as good sources of MK-4 but the fact of the matter is that these foods, while highly nutritious, do not contribute significantly to vitamin K requirements for activation of VKD proteins. .
Great article, thanks for this. After reading Chris Masterjohn’s article on K2 and playing around with his food database, I was also skeptical of the disparity between MK-4 levels in goose liver vs other animal livers shown in studies. As you point out there is no immediately obvious reason why MK-4 levels in goose liver should be 25x higher than those in chicken liver. The only possible explanation I can come up with is that in nature geese are temperate migratory birds, so it does make some sense that they would accumulate fat soluble vitamins to a greater degree than chickens, which are descended from the tropics where there is food year round. It’s also notable that a brand of Emu oil is in the database with 416μg / 100 ml MK-4, making it the best fat/oil for K2 content by some distance. This could be because Emus are very large birds that take 15-18 months to slaughter compared to 6 weeks for chickens and they are commercially farmed, so if menadione is added to their diet this will accumulate over a much longer period of time leading to higher K2 levels in tissues. It does seems likely that as with tissue fatty acid composition, the diet is a major influencing factor on tissue K2 levels in poultry regardless of the species. I am interested in vitamin k food sources and I am struggling to come to terms with the fact that vitamin k is a fat soluble vitamin but the best sources of vitamin k1 are low fat leafy greens! Not only that, the advice is to eat them with a fat source….. I can’t believe we evolved getting our k1 from leafy greens, as leafy greens are best cooked to be digested and we didn’t cook food until relatively recently in our evolutional history. Therefore I wonder if we actually obtained our k1 from grass eating animals? We can obtain omega 3 from grass fed animals so why not k1? Makes far more sense to me from an evolutional point. Great documentions , my question is : does goose or duck fats are a good source as the liver for the mk4 ? Hi. An educated guess: goose liver has a high amount of MK4, duck fat also so it is thinkable that goose fat and duck liver might also be high in MK4. Gascony is a region with a high number of cenanarians and they consume a lot of goose and duck fat. VitK2 is the thing they share with the Japanese. French paradox is a fat thing. Greeetings! Good find and fascinating article. Only drawback, the presence of Menaquinones has been detected in dark honeys, but the concentration of them has not been measured as far as I could understand. I have a recipe for absorbable K2 from natto relatively free of the noxious odor. I supplement with a Vitamin K2 enriched liver/soft cheese pate. I ferment frozen natto starter beans by homogenizing in a blender with 1 cup unsulfured molasses 1 cup nutritional yeast diluted to 2 liters with filtered water. I add 3.5 liters per minute air from aquarium pumps and eight air stones. Fermentation endpoint is froth to overflowing from the 1 gallon glass ferment vessel in approx 2 days. Better yields would return by fermenting in a cut off 5 gallon plastic water bottle. The fermentation liquor homogenizes in a blender with several pounds of any cooked liver and many pate spices. I slow cook the slurry down to a paste. As the slurry boils the obnoxious odors are removed. I mix the warm not hot paste with any soft fermented cheese. Brie is a good choice according to documented Vitamin K content. I have used cream cheese, labneh, and Danish feta. A serving of my pate is a generous amount to fit in a rolled corn tortilla. One per day keeps my fingers tingling and sensitive. Commercially fermented natto on rice straw has yielded 10 grams/liter of K2. My ferment may achieve only 1 gram/liter but if so my daily K2 is a milligram or more. Lance Armstrong noted on his website that high doses of vitamin K2 caused tingling in the fingers. I notice the same tingling and extra sensitive fingertips. I attribute this to more efficient substitution of MK7 for ubiquinol in the mitochondrial transport chain to produce more ATP and stimulate nerves. Physiological comparison of athletes with and without K2 supplement showed 12% improved aerobic performance with K2 supplement.